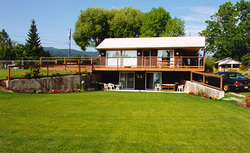 Shoreline Inn overlooks a spectacular view of Flathead Lake. The beach, ideal for swimming and water recreation, is accessible from the cabin. The cabin, with bath and kitchen, accommodates four and is perfect for the guests seeking seclusion. Hot tub, large dock, personality. Continental breakfast is served and children are welcome. Directions: The Shoreline Inn is located 15 miles south of Kalispell in Lakeside. In Lakeside there is one flashing yellow light, turn east off of Highway 93 onto Lakeside Boulevard. Go 1/3 of a mile and you'll see the sign on the right.